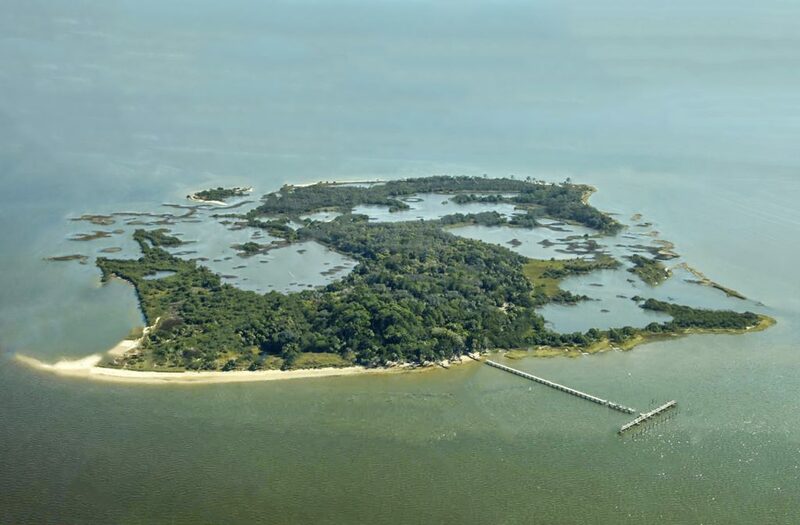 Cedar Key is a city located 50 miles southwest of Gainesville, Fl on SR 24, in Levy County. The group of keys are named after the Eastern Red Cedar tree, which played a predominant role during the 1800’s. Cedar Key was actually offshore from where the city is located now, on the island key of Atsena Otie. “Atsena Otie” is from the Muscogean language “acheno ota” which translates to Cedar Island. 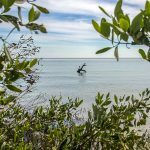 It was here that settlers established the town Cedar Key in 1842. In 1868 the Eberhard Faber Pencil Company built a lumber mill on Atsena Otie, supplying cedar wood to it’s pencil factory in New Jersey. A major hurricane and 10’ storm surge destroyed the mill in1896. Much of the salvaged homes as well as wreckage from the mill were floated over to re-establish the town of Cedar Key on Way Key. Remnants from the old town, as well as a cemetery still remain on Atsena Otie. 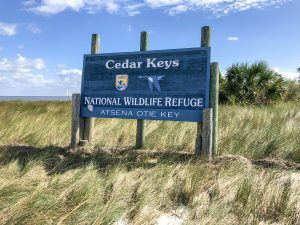 It is now managed as part of the Cedar Keys National Wildlife Refuge. 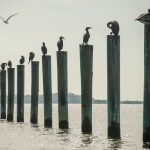 Location: Cedar Key is a city located 50 miles southwest of Gainesville, Fl on SR 24, in Levy County, 29°8′44″N, 83°2′30″W. 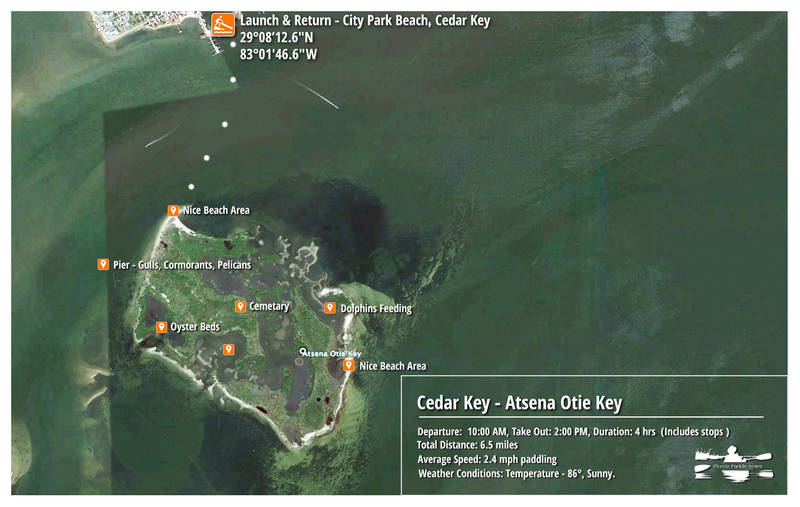 Atsena Otie is the closest key, located approximately 1/2 mile south of Cedar Key. 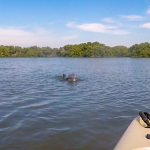 Cedar Key to Daughtry Bayou: – Approximately 4.5 miles round trip. Difficulty: Easy paddling. Keep track of tides so as to not get trapped inside Atsena Otie or in the bayou around the airport. Keep watch for boats in the channel. Average Paddle Time: This varies greatly depending on stops and exploration. For an approximation of actual paddling time, simply use an average speed of 2.5 mph. 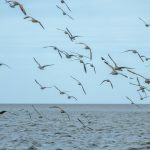 Current – Tidal: Definitely tidal and the current is strong in the channel at the change of tides. Rest Areas: There are numerous places to paddle on shore and enjoy the beaches of Atsena Otie. Near the kiosk on the West side there is also a bathroom. 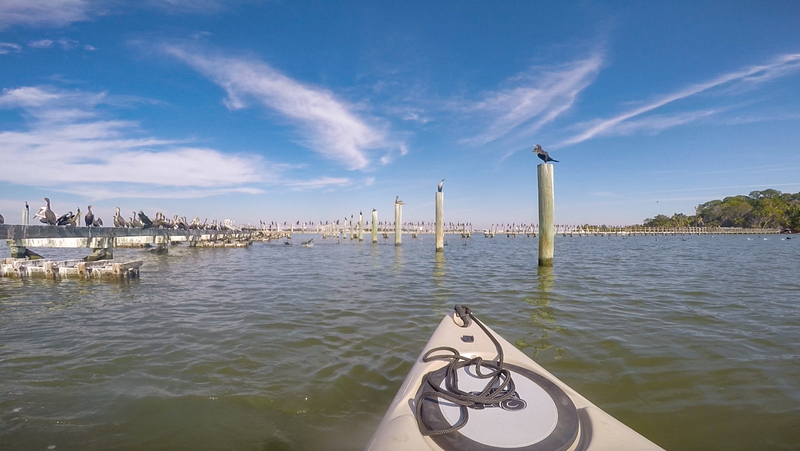 Paddling over to Atsena Otie Key is always an exciting, fun paddle. We usually time our paddles to take advantage of high tide. As a result, the high water will allow us to explore the interior of the key in addition to the outer shoreline. The launch is a nice sandy beach at City Park just East of the Marina. There is no fee to launch and parking is free along the park sidewalk. The first thing to note is the strong current from our left to the right, flowing out to deeper water. With the key somewhat to our right, we angle leftward, allowing the current to guide us to our destination. Our paddle takes us on the West side of Atsena Otie and the old abandoned pier. 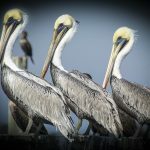 This is the roost for hundreds of Cormorants, Pelicans and Seagulls that all take flight as our kayaks silently pass by. Continuing around the west side of the key, the water is noticeably calmer as the current is being blocked. From here we enjoy the calm waters along the Southwest shoreline. There are 2 main ‘inlets’ along this Southwest shoreline that provide access to the interior of Atsena Otie. The first is right at the Southwest corner of the key. This is a small lagoon that does not allow passage further inside the key but it is pretty. Lined with mangroves, It is here we saw an eagle on a past trip. The entrance to this small lagoon is lined with oyster beds, so be sure to stay in the small channel during lower tides! 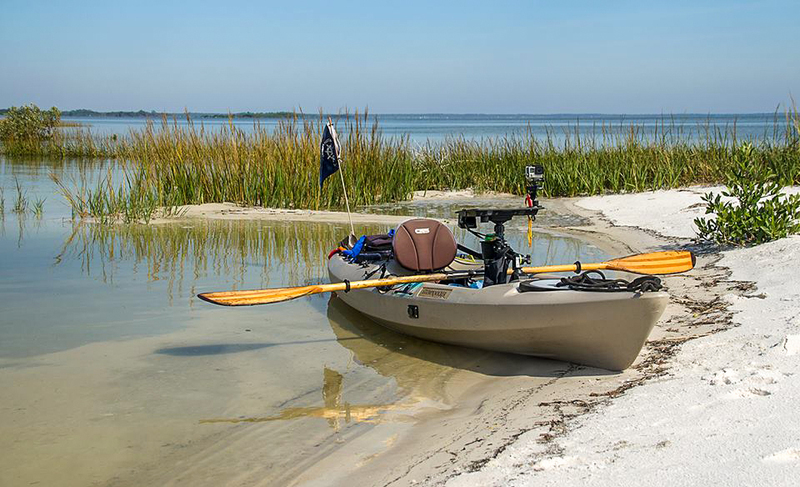 Depending on the water level, it is possible to not have to exit out into the gulf but paddle inside a small channel to get to the next lagoon. It is in this next lagoon that offers access to the interior of Atsena Otie. 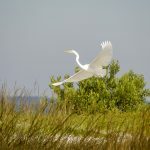 Herons, Egrets, Osprey and an occasional Eagle can be seen inside the key. 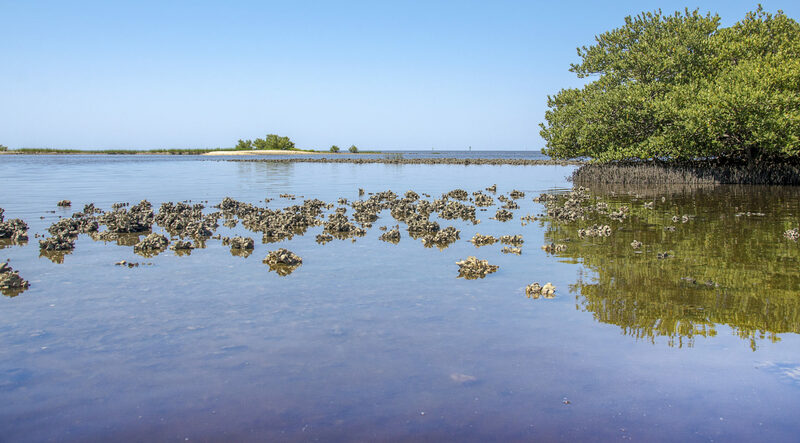 Here, again, it is important to know the tides to have access and to not get scraped on the oyster beds. There are many sandy beach areas along the Eastern shoreline. About two thirds the way up there is a small passage, when at higher tides, allows passage in and out of the interior. 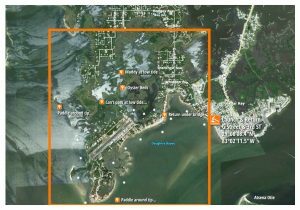 This is another area with numerous oyster beds. It is in this lagoon, in the Northeast corner of the key, that I was able to photograph a Dolphin feeding. 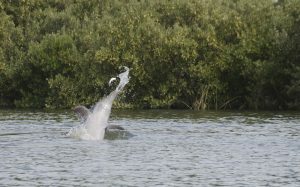 It was actually playing with his food, throwing the fish up in the air numerous times! 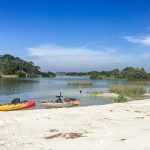 Aside from the paddle to Atsena Otie and the other outer islands, there is the option to paddle inside Cedar Key aka Way Key. 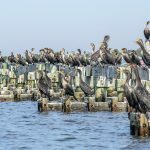 There are several scenic lagoons around the city limits of Cedar Key. Characterized with sea grasses and oyster beds, they offer a pleasant side paddle during the higher tide. 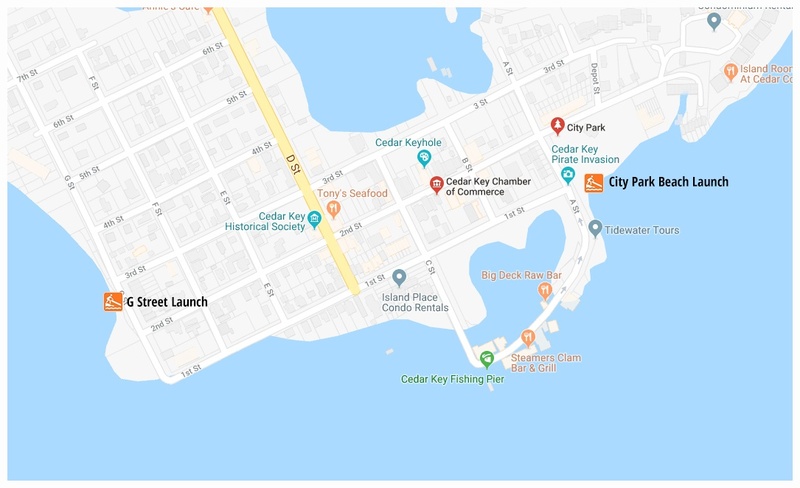 We launched from G Street and 3rd Street on the Southwest side of Cedar Key. There are a number of rocks and oysters here so it is best to be at the higher tide. From here we followed the shoreline to the northwest, eventually heading Southwest around the tip of the airfiel. There are several sandy areas here with numerous gulls. Making our way around to the north side of the airfield runway, there are a couple of choices where to go next. Continuing Northwest around the key, then heading Northeast along the shore will lead to the first of a row of homes. 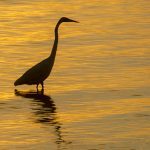 It is here that we decide to move inward, making our way through small channels in the tall sea grasses. It is easy to loose your way here due to limited sight range, so a tracking app on the phone is a big help. 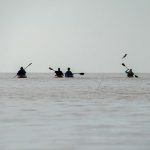 We paddled all through the interior lagoons and as the tide was going out decided to paddle toward our exit designation. Low tide was approaching quickly and we hit several no passage areas where lack of water and mud prevented further exploration. Within a small amount of time, we reached our main channel that led to the exit under the bridge on airport road and returned to the G Street launch area. While picturesque, these inner lagoons require high tide in order to navigate and enjoy them. 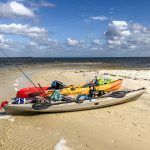 We always enjoy paddling the Cedar Keys and one day may adventure further out to one of the few other keys offshore. 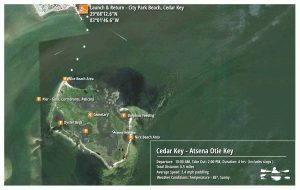 For other Notes on the Cedar Keys see The Cedar Keys – Scale Key and The Cedar Keys – Atsena Otie – Aug 2018. This closes another chapter of Florida Paddle Notes until next time!